Edublogs, the service behind U.OSU, hosts an annual awards celebration to promote and demonstrate the educational values of social media. Some of the best teaching and learning content, on Edublogs and other social media, has undoubtedly been created right here at Ohio State. Help recognize our content creators by submitting a nomination by Sunday, December 1st. Submit your nomination as a blog post. Add a New Post to your U.OSU site, and link to your nomination recipients within the post. To see an example entry, or ideas for nominees, check out Steve Lieb’s nomination entry. 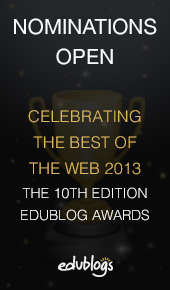 Submit your nomination entry to Edublogs by grabbing the link from your blog post and pasting it into this form. Only the most nominated will make it to the voting round, so share your post and encourage colleagues to write their own. You can’t self-nominate, but don’t be shy about asking a friend for a submission. When posting to social media, include #Eddies13 for some extra oomph. Details on the contest rules, timeline and last year’s winners are available on the Edublogs nominations page. Ready, Set, Nominate Oho State!